A new UAS runway opened in Virginia – with the Governor attending and controlling a UAS! Governor McAuliffe: “I have witnessed first-hand the impact that the UAS industry will have on the future of transportation and our lives will change as we know it. You will be able to do just what I did today – hop in a plane, press a button and the machine takes you where you want to go!” Governor McAuliffe – we’ll be taking about your experience in my Drone Law class today at George Mason Law! The Trump administration is reportedly advocating to include language in the 2018 NDAA relating to drones. The provision would allow law enforcement to “track, hack and destroy any type of drone over domestic soil with a new exception to laws governing surveillance, computer privacy and aircraft protection.” Allegedly, government agencies would have to protect “privacy, civil rights and civil liberties” in doing so. But we don’t necessarily know what privacy and civil rights exist in regard to UAS usage. AUVSI wasn’t particularly happy with the DC. Cir’s ruling I wrote about last week. And a drone crashing into a baseball game. Remember, no UAS around major league sporting events! Both because of Part 107 requirements (limiting flight over people) and general aviation airspace restrictions! More to follow but in short the court ruled that the FAA violations section 336 of the 2012 FAA Modernization Act by promulgating a rule on model aircraft. They didn’t buy the FAA’s argument that is was ending “regulatory discretion” not to require full blown registration. Taylor argued the case pro se! Some more XPONENTIAL 2017 announcements that I’ve been tracking from a distance. Both are followups on products I’ve written about previously – Aerovironment multiple times and the Wave glider from XPONENTIAL 2016 in the Big Easy. Why the ski banner? While, XPONENTIAL 2018 will be in Denver, Colorado. I’m a big fan of skiing, and April 30 is still the tail end of ski season…(Disclaimer: I’m not advocating the use of UAS over ski areas. Please respect property rights and make sure you are flying safely and IAW FAA regulations). AeroVironment announced Snipe, which is says “is designed specifically to provide dismounted troops with immediate organic tactical overwatch – over the wall, down the alley, around the hill. Weighing less than 5 ounces, this foldable air vehicle requires no assembly and can be out of the case and operational in less than 60 seconds.” Access the Data Sheet here. While announced at XPONENTIAL, this nano UAS won’t be available until the fall. 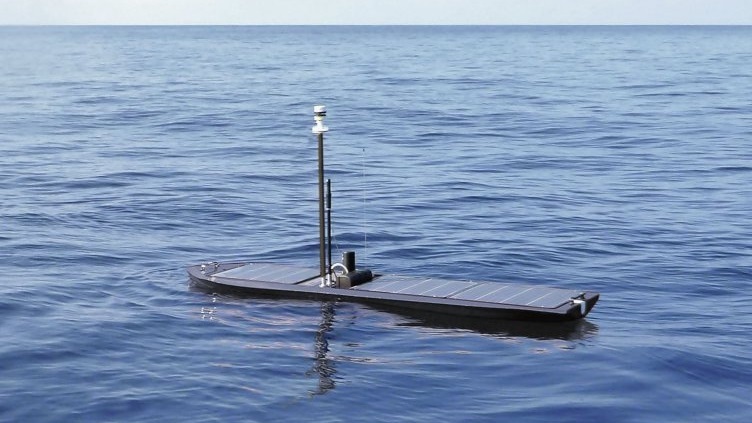 Wave Glider, made by Liquid Robotics (which has since last year become a Boeing subsidiary), has expanded capabilities, based on their interview with Jane’s This is an unmanned maritime vehicle, but given my background and the technology, I couldn’t help writing about it! For the first time since I founded Duke of Drones, I won’t be at AUVSI’s Xponential due to other commitments. However I’m tracking the updates and looking forward to the news to come out of the conference. Lockheed Martin has announced Indago 3 this week. I reported on an earlier version of the Indago when it was undergoing testing for use in firefighting. Extended range radio for long distance operation at low-flight altitudes. It uses the TW-600 Ocelot™ by TrellisWare for Tactical Scalable Mobile Ad-hoc Network (MANET) or TSM to provide reliable communications in harsh environments, but which clearly has ITAR implications. The Indago has evolved from a firefighting UAS to a mobile, military grade tool in only a few years! What else do we expect out of AUVSI? I’ve heard rumors that the FAA might announce something regarding BVLOS, and that’s what I’d place my bets on. Why do I say that? While, check out the FAA Safety Briefing (May/June 2017). It’s all about UAS, which is likely not-so-coincidentally timed with Xponential. Check out the topics and you can see what is front and center for the FAA – Integration! There are also articles on registration, part 107, and how to find a “DroneZone,” all of which have integration lying close beneath the surface. This is great news, in my opinion. We obviously want UAS integrated into the NAS – that’s the only way they’ll ever be able to operate effectively in populated areas, near airports, and around low-flying helicopters. As people adapt to 107 and it proves its worth, I think the next piece is BVLOS – one person per aircraft. Then swarms are the next step. Swarms within VLOS aren’t really that big, so let’s get BVLOS down and we’re making some real progress! In local Rochester news, a photographer named Adam Hudson took aerial shots of the Erie Canal being filled. 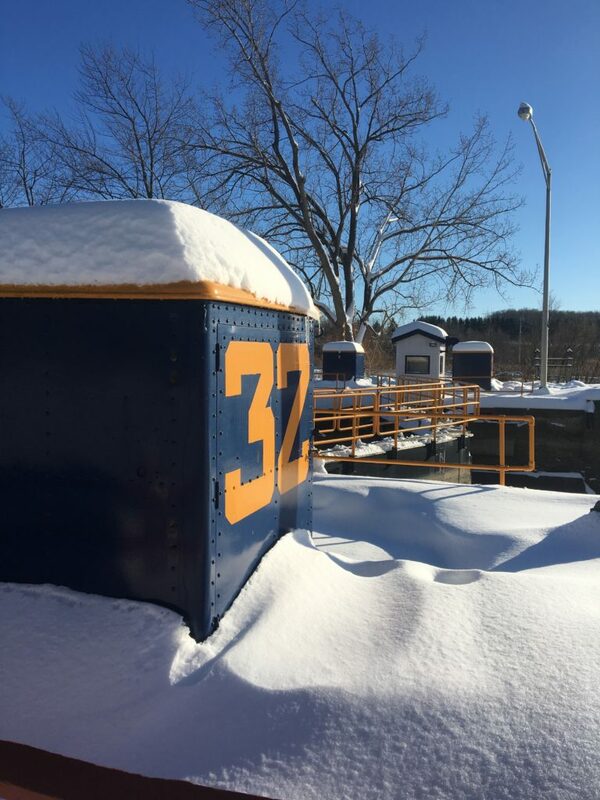 Check out the video here – it’s taken at Locks 34 and 35 (between Rochester and Niagara Falls). 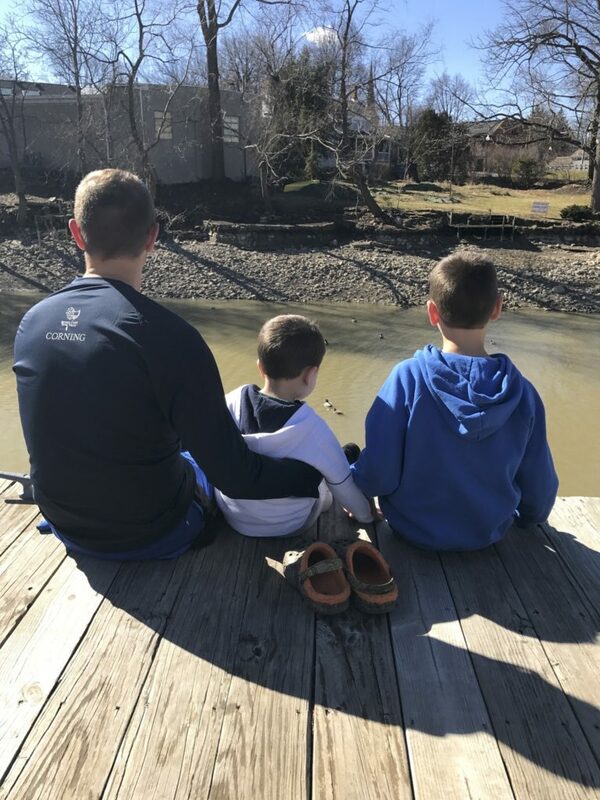 With my boys on an unseasonably warm day in February 2017, Pittsford, NY overlooking a drained canal. 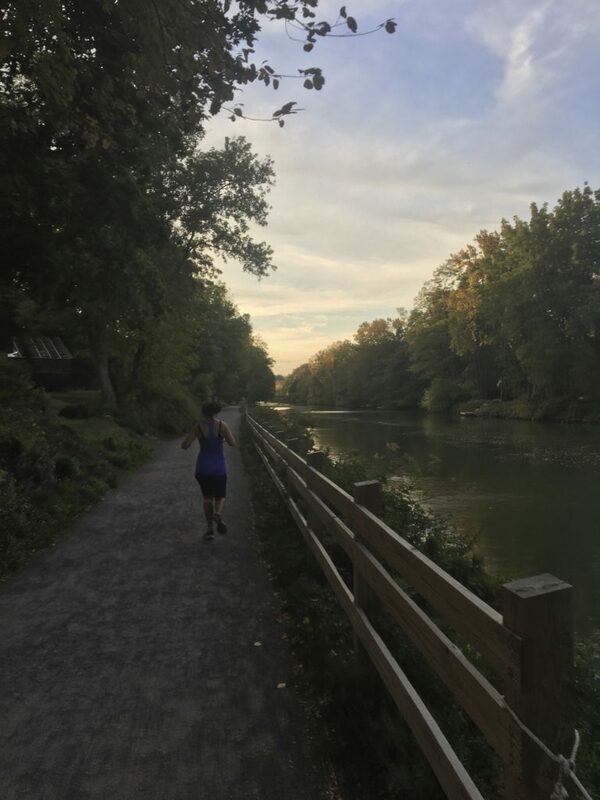 Flattest 15 miles my wife and I have ever run, but beautiful day, October 2016. 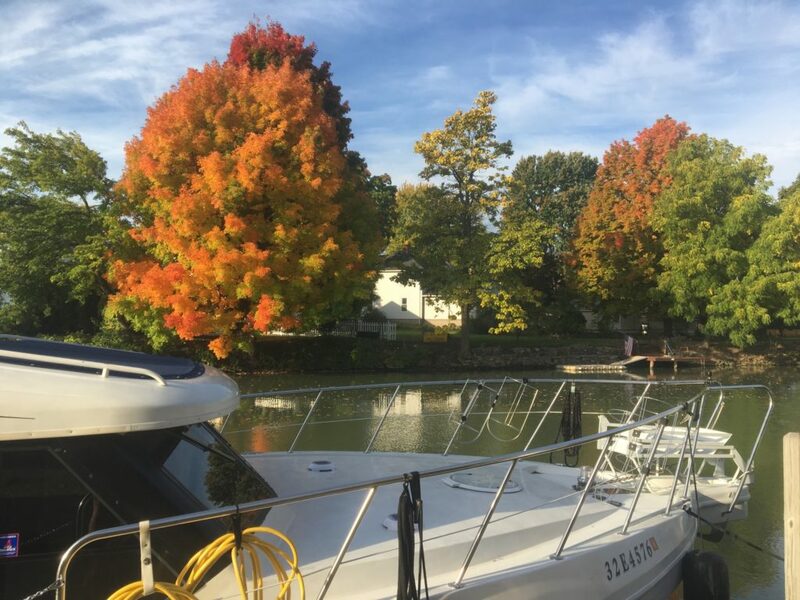 Here are a couple of photos that I’ve take on the Erie Canal – in Rochester it’s actually the larger and more modern “Barge Canal,” which is drained for the winter. One doesn’t typically think of spacecraft as UAS, but they are. Most are one way, but an X-37B just returned to earth after two years in space. The Boeing X 37B, an unmanned space orbiter that looks like a small version of the space shuttle, returned from a 718 day secret space mission that began back in May 2015. It apparently created a sonic boom as it came into Cape Canaveral for a landing. It is launched using United Launch Alliance’s Atlas 5 rocket. There has been good news coming out of state legislatures. I’ve been tracking the progress of a bill in my old state of Connecticut, which would have allowed law enforcement to use weaponized UAS. Yesterday it died in committee. I am all for law enforcement being provided the tools to do their job, but UAS are powerful and we as a society are still learning how to effectively incorporate them into ouThere has been good news coming out of state legislatures. Toms River, New Jersey tabled a proposed ordinance which would have required UAS operators to register and pay a $70 annual fee. 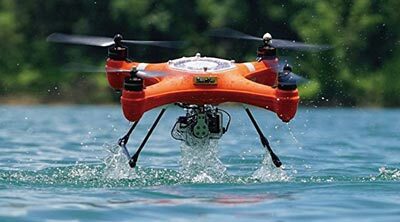 It would have prohibited UAS operations below 400 feet in the following locations and over beaches when lifeguards are on duty, dunes, residentially or commercially zoned areas, any roads, or over government or public buildings, property, or parks. Law enforcement agencies and legitimate scientific researchers would have been exempted and use at events would have been authorized with permission of the organizer and notice to attendees. My concerns are two-fold. First, we need to avoid a hodge-podge of broad local and state ordinances. I’m not opposed to local ordinances relating to specifically local concerns (i.e. : beaches during lifeguarded hours and protected dunes), but the FAA needs to be allowed to develop a coherent national system. Secondly, the ordinance, as proposed, is overbroad. The FAA and the Alliance for System Safety of UAS through Research Excellence (ASSURE) issued a joint report on the severity of UAS impact on humans, specifically in comparison to an impact with wood or steel. They conclude: “Results strongly suggest RCC-based thresholds are overly conservative in terms of injury potential because they do not accurately represent the collision dynamics of elastically-deformable sUAS with larger contact areas in comparison to the inelastic, metallic debris that occurs following the in-flight break up of high-speed missiles found on the national test ranges.” In short, UAS impacts do not transfer as much energy to humans due to their elastic nature (editorial note: I still wouldn’t want one to fall on me). I saw another article regarding the pizza drone incident. This author didn’t appear as amused by the article or it having been picked up by mainstream media. I don’t agree with his premise, though. A journalist should fact-check an article to ensure it is accurate, whether it be a satire or allegedly real article. 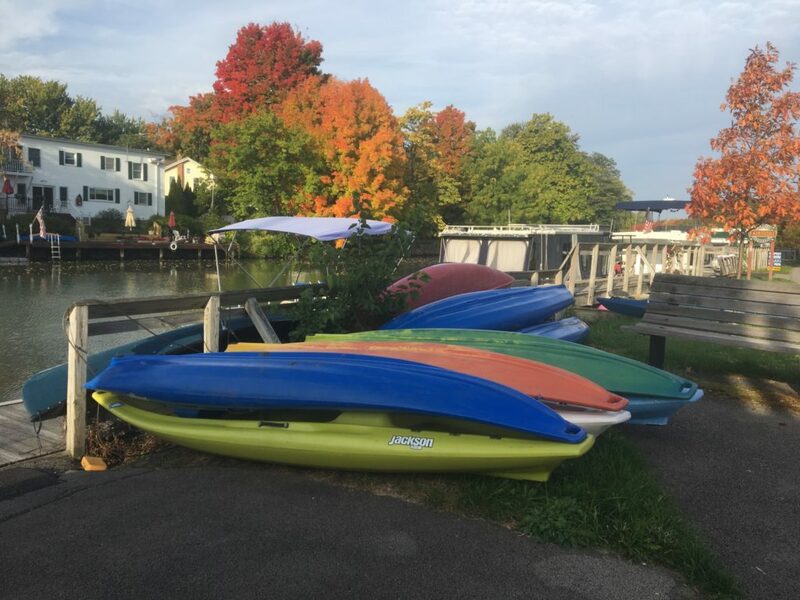 On the surface, it should have raised some red flags (for example, the speed at which the case moved through court was shocking as well as the fact that the docket number did not appear on the Merrimack Superior Court’s publically accessible website).